Coba was among the major Mayan capitals of the Classic Period. During this era, the city rose to regional prominence and political power. It continued to be actively inhabited as late as the Spanish invasion, unlike many other Mayan cities which had been abandoned long before. Coba was among the largest cities of the Mayan civilisation and it displays some of the cultural influences from Central American cultures. This is especially visible in the Classic Period architecture of the city which resembles the architecture in the ancient Central American city of Teotohuacan in some of its features. Coba was among the earliest Mayans cities that were inhabited. Today, archaeologists believe that the city was first inhabited sometime between 100 B.C. and 100 A.D. During this period, it was a small town with a tiny population. Towards the 2nd century, there was a rapid growth in the population of Coba. The city reached its peak between 200 and 600 A.D. During this time, the city had a large region under its control, was home to populations as high as 50,000 and had access to water bodies. Coba also enjoyed control over certain trading routes which, coupled with the water resources, allowed the city to flourish. The city’s decline began after 600 A.D. and by 1000 A.D., Coba’s influence waned and nearly ended yet the city continued to exist. It was ultimately abandoned after the Spanish conquest in the 16th century. Between the period of 200 A.D. and 600 A.D., Coba rose to prominence as a regional Mayan power. Two key factors contributed to the economic strength and the consequent political influence of Coba: the city had immediate access to vast water bodies which were critical for the sustenance and growth of any Mayan city; and Coba was strategically so situated that it controlled several trading routes, which let it overlook the trade along these routes and benefit significantly from it. Coba was also able to augment its economic success by forging close ties with other major Mayan cities such as Calakmul and Tikal. Traces of other cultures in archaeological finds from the city suggest that Coba traded as far as Honduras and was also in touch with Central American civilisations of the era. Most of the significant Coban architecture was constructed during the era of its prominence in the Classic Period, between 200 and 600 A.D. A second phase of construction commenced after the city had already declined but was stabilised and not abandoned, between 1200 and 1500 A.D. Among the most notable constructions hosted at modern-day Coban ruins are the Nohoch Mul Pyramid, Sacbe, the Pyramid of the Painted Lintel and numerous stela. Another significant part of the Coban architecture are two large ballcourts which have sloping sides, unlike the ballcourts in many other Mayan cities with vertical sides. In total, archaeologists are of the view that more than 5000 structures exist at the site of Coba, although very few are open to visitors. Nohoch Mul pyramid is the iconic face of the Coban ruins, being among one of the tallest pyramids to have survived since the days of the Mayan civilisation. The pyramid has a height of 137 feet and from the top, it affords a clear view of the two lagoons near which Coba’s foundations were laid. 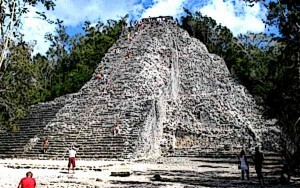 Nohoch Mul is the tallest Mayan pyramid along the entire Yucatan Peninsula. Sacbe is another prominent feature which stands the Coban ruins apart from the ruins of other Mayan cities. Sacbe refers to white roads that were constructed in Coba city. The city houses a huge number of these roads, going as high as 50, although less than 20 of these were opened to the public. The roads were constructed in all directions from the Nohoch Mul pyramid, following the four cardinal directions of the Mayan religion. The sacbes were nearly 10 to 30 feet in width and were primarily used to facilitate the Mayans in trade activities. One of these sacbes is as long as 100 kilometres. Being made of lime, these sacbes shone under moonlight and were also a sort of guides to those travelling to or from the city of Coba during the dark of the night. The stelas that have been found at the ruins of Coba are of particular interest in context of the history of the Mayan civilisation in the region. Archaeologists recovered a number of these stelas from Coban ruins. Many of these contain engraving meant to convey the history of a specific event or a major occasion in the city. One of the stelas recovered from the Coban ruins incredibly depicts that the city had many female rulers. Coba was largely abandoned, forgotten and lost following the Spanish conquest of the Mayan regions in the 16th century. Reports about the location of the city began emerging in the 19th century but researchers and archaeologists were unable to visit the site due to a long war in the region. As the exploration of Mayan sites experienced an uptick in the 20th century, researchers were also finally able to access and explore the site of Coba, beginning a series of visits which began in 1926. The Mayan city of Coba was first inhabited as a town between 100 B.C. and 100 A.D. It witnessed a steady uptick in its population from 2nd century onwards. Between 2nd and 6th century, Coba became a huge and influential political and economic power in the region. Access to large, accessible lagoons and the location of the city on important trading routes helped the city rise in power and influence during this period. Most of the city’s prominent architecture was constructed during this region. The city’s architecture betrays influence from other Mayan cities as well as from Central American civilisations of the era, which further affirms its significance as a key post along the trading route. The city continued to be inhabited until the 15th century when it was finally abandoned following the Spanish invasion. It was later rediscovered and explored during the 19th century.